As warmwater fly fishing grows in popularity, target species such as bass (large- and smallmouth), sunfish, perch, and even carp demand increasingly sophisticated techniques from the modern fly fisherman. The American Angler Guide to Warmwater Fly Fishing offers a quick and succinct look at the essentials of this growing sport. 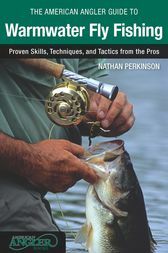 With an array of beautiful photos and instructive illustrations, this guide delivers everything beginning and intermediate anglers need to know about casting technique, gear selection, fly choice, and how best to approach various fish species in their favored habitats. A selection of essential flies and tying recipes rounds out the first essential book for warmwater fly fishermen. Nathan Perkinson grew up in southern Indiana, where he spent his youth catching bass, panfish and catfish. He earned a bachelor's degree from Franklin College of Indiana in 1997. He received his first fly rod at age 16 and by age 24 he was tying flies, making leaders and using fly tackle almost exclusively. Nathan's fly-fishing articles have appeared in American Angler, Fly Tyer and Flyfishing and Tying Journal. He currently lives in Portage, Michigan, where he fly fishes for warmwater species as well as trout.